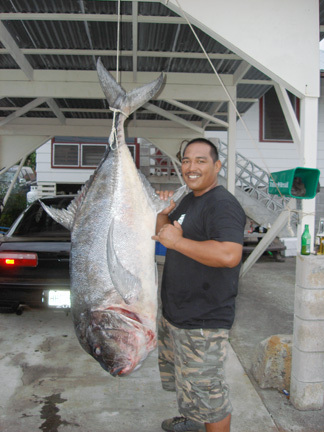 Jason Abadilla was competing in the 2008 S. Tokunaga Store Ulua Challenge when he met the fish of his dreams. The 124.6-lb giant trevally engulfed Jason's bait then went on a rampage. The fish fully tested the resiliency of Jason's Sabre pole, Newell 646 reel and Ande 80-lb test line and found them to be up to the task. Jason not only became a member of HFN's elite 100 Plus Club, he also won the tournament.